Grey Shades Leather Designer Collar and matching chain/leather leash. 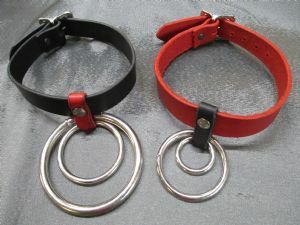 Our specific Grey Shades designer collar is a three piece item, that can be worn in different ways, with or without the two strap panels and center drop ring loop, or without, making this a very versatile collar. It has a one inch wide leather strap in dark grey leather colour, with locking roller double buckle and keeper, the two grey leather removable panels are lined in luxury red suede, bonded and stitched and finished with four decorative double cap rivets to match the other products in this designer range. The center piece which again is removable from the strap also has a removable drop ring which can be separated from the front center strap for if the wearer wanted to wear the collar in a Vanilla setting discreetly. The matching Leather/chain leash has a handle in the same high grade grey leather, which is bonded and stitched, then fixed onto a long fine welded link chain with end trigger release hook. please message us, we make for all sizes. ** NOTE** Please make sure to measure neck correctly before choosing size options and making your purchase, as later mistakes cannot be rectified without an additional cost being applied once your order is in process. 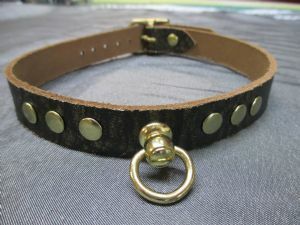 Each collar is custom made to the customers specifications indicated. 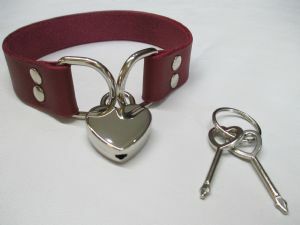 Listing is for a single leather Grey Shades Design Collar and matching leather/chain leash. "Allow me to thank you. I have received my order today and I am astonished by the quality of your products. The leather is of such quality. Not to say how entranced I am by its delicate smell.